A grand excursion from the ancient town of Lewes all the way to a microcosm of Spain by the costa, by way of lowland villages and spacious downland vistas. 7. 5 miles, 12.5 km, 250 metres of ascent. A varied walk exploring the flatlands of the Ouse Valley, the hamlet of Iford, the east face of the downs, a vineyard and its issues, hidden downland valleys, finishing with a glass of riocha and some tapas at the nearest costa to Lewes. On the first part of the walk there are a number of stiles. There are also one or two points at which the route can get a bit muddy after prolonged rain on this part. All this can be avoided by taking the bus to Northease. You do not have to go through airport security checks or sit in a little tube breathing stale air. Trains to Lewes from Seaford, Newhaven, Eastbourne, Hastings, London and Brighton. Buses to Lewes from Brighton and Uckfield and surrounding villages. The best place to get off of the bus is at Lewes Law Courts in the High Street. Walk east from the stop to the traffic lights. Then turn right down Station Street. The station is about 400 metres down the street and can be clearly seen once you pass the Lansdowne pub. 123 bus Monday to Saturday between Lewes and Newhaven, calling at Northease. Frequent buses from Saltdean along the coast to Brighton, Newhaven, Seaford and Eastbourne. Whitecliffs Café bar on the front at Saltdean- Spanish Café 10-5 Sunday to Thursday, 10- Late Friday and Saturday. Saltdean Tavern Just north of Saltdean Lido, undistinguished food, but very cheap. There is a pub called the Spanish Lady in Saltdean, but it is not on the route and the only thing Spanish about it is the name. On Lewes station, immediately north of Lewes Station, on the front at Saltdean to the east of Whitecliffs. 1)Start at the main exit from Lewes station. Turn left and walk to the mini roundabout. Bear right here. Walk straight ahead for about 400 metres until you reach Southover Church. Turn left immediately after the church and walk through the tunnel under the railway. You pass the Southdown sports club. Immediately after this turn right and follow the road round to the left through a tunnel. When you come out of the tunnel turn right and almost immediately see a gate which goes off to the left, into the playing field. Enter the playing field and then go through the gate out of it about 30 metres away. Turn right after the gate and walk along a path on top of a bund by the drainage canal. You pass the sports ground on your right. 2)At the end of the sports ground follow the path to the right, but do not join the road. Instead, just before you reach the road, you will find a path going sharply left across the next field, which leads to a in the opposite hedge. Cross the stile and then cross the next field in the same direction. You now come to a stretch of path with fences on either side. This can get a bit muddy after periods of heavy rain. Pass the garden centre on your right and then the small sewage works on your left to emerge in a lane. Turn right here and after about 10 metres turn left following a footpath sign. You emerge in a large field. Sometimes this field is ploughed over and planted with crops. If it is please report this to East Sussex County Council This is a well-used path so it is likely that other walkers will have left a trail which you can follow. If this is not the case then walk due south, gradually approaching nearer the road. If in doubt keep right. 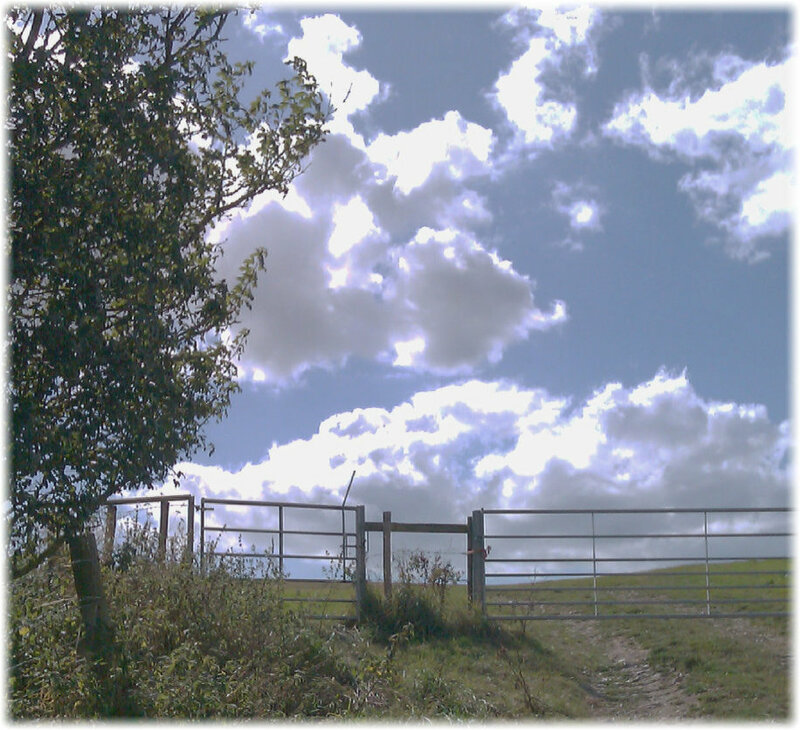 You are aiming for a stile which can be found in the hedge about 40 metres from the road. Ploughing up paths is a big problem in the low Weald. A farmer is allowed to plough up a path across a field but must reinstate it quickly. Very often these days the ploughing and planting of crops is done by contractors, who do not know where the path is. Sometimes a farmer is tempted not to bother reinstating a path. If no one complains and nothing happens then they think there is no problem and they decide not to reinstate the path the next year. In 2012 the rights of way team and the Ramblers co-operated to take action on around 80 examples of this sort of problem. Most of the paths were cleared. But nothing will happen if you do not tell the council about any problems that you find. 4)Your general direction continues straight ahead and there are two more stiles to climb before you reach the lane to Iford village. The path carries on straight ahead, but your route turns left along the road for a visit to the village, with its Norman church which has survived its Victorian mutilation quite well. There are also some attractive houses. There is still some flavour of how villages like this must have been 100 years ago. 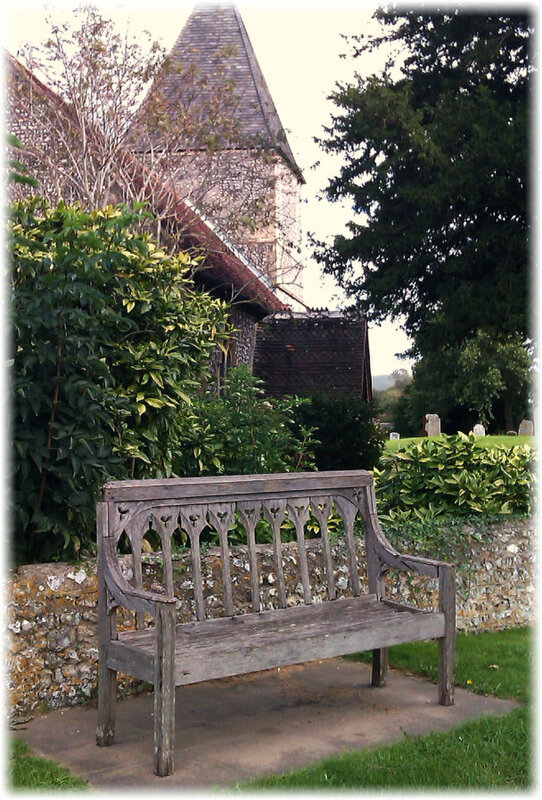 There is a really lovely seat you can sit on outside the church if now seems a good time for a rest. At the end of the village the road turns sharp right. You take the path to the left. Initially the path runs along the boundary of the field, but when this turns left, the path continues straight ahead. Cross the field. In the next field aim for the far right hand corner. Turn right for a couple of metres on a track to meet the road, where there are bus stops. You could join the walk here, reducing the distance by around 4km/2miles. Your route goes up a concrete farm road on the opposite side of the road, slightly to the right. Follow this road as it climbs up the downs. You are now leaving the Ouse Valley for some secret places in the downs. As you go, notice some small galvanised gates on the side of the track. These are to give you access to the freedom to roam land to which access was won after long campaigns by the Ramblers. The land, on which you are entitled to roam freely provided that you cause no damage, is shown on Ordnance Survey explorer maps in yellow fringed with brown. You may also see the access symbol, a brown person on a circular sign. At the top of the hill you cross the South Downs Way. Time, perhaps, to get out the violin and earn some money from passing walkers. Your route carries on straight ahead, descending slightly. Come to track on your left with a symbol of a brown man who has been crossed out. Your route, however, continues straight ahead down the hill. This is a lost and secluded part of the downs. 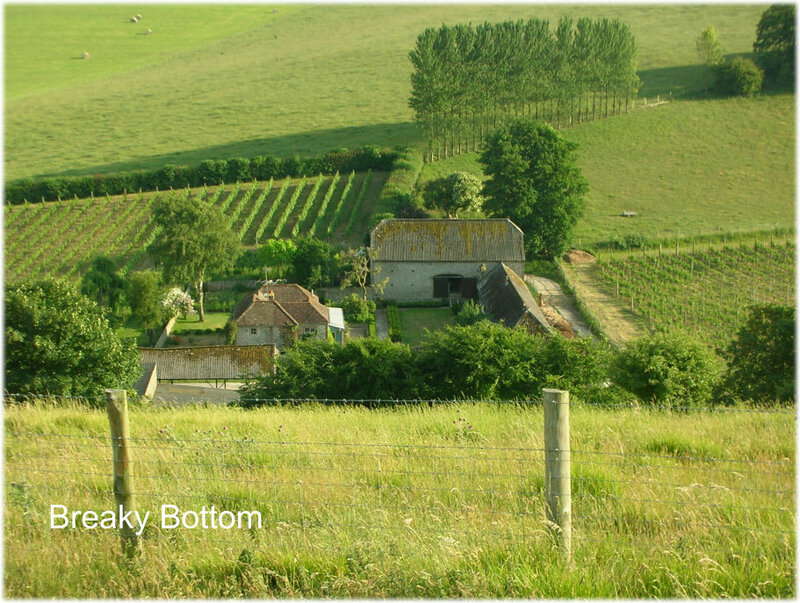 Below you is the Breaky Bottom vineyard. But such an idyll is not without its problems. In recent years huge amounts of water and slurry have descended on the vineyard because the farmer of the land around it had planted winter crops so the water and earth ran down the hill rather than soaking in. It is not just townies who suffer from difficult neighbours. But perhaps we may not feel too sympathetic. The crossed out brown person is there because this is access land, but the vineyard owners have managed to convince the authorities that access should be denied because of the existence of a chalk pit on the site which people might fall into. These pits are common on access land and, of course, nearby Seaford Head is still open. When it was suggested that the pit could be fenced the reply was that fencing would be unsightly. Note the large amount of new fencing elsewhere on this site. You can explore the access land to the right of the vineyard a little further on, and there are some lovely places there. 5)Descend into the valley and then rise up again, Keeping straight ahead. You come to a point where the fence by your side turns right. The legal right of way goes right here and then left after about 100 metres, but the path on the ground goes straight ahead here. At the top of the hill various coastal towns are laid out before you and you can look out over the sea. Can you hear the sounds of joyful holiday makers yet? The path meets a wide grassy track. Turn left here and keep going straight ahead, ignoring various routes to the left and right. 6)You come to a Telscombe council sign telling you that you are on Telscombe Tye- a large piece of open ground The right of way goes left here, but you go straight ahead, heading south, initially alongside a long line of trees. Cross a track that comes in from the left and continues diagonally to the right. You will now see a fence l which comes in from the left and then turns a corner to head down to the sea. Not so fast! What you are seeing is typical of the many Spanish urbanisations that have cropped up on the costas in recent years, although it predates them. Typically, it contains numbers of brits who have retired to the place they used to take their holidays. It has also been a package holiday paradise. Billy Butlin, who practically invented the package, ran the huge and imposing Ocean Hotel here, taking it over after the second world war as one of his few hotels. It was built in the art deco style to look like an ocean liner. The front façade, which you may be able to see, has been preserved, in its conversion to flats, although the rear, which you will see later, is almost unrecognisable. In the 1970s the water company obstructed this path through their works and for many years they denied that there was a right of way. Everyone thought it was a done deal and that they had gone through the formalities, but in the early part of this century and eagle eyed member of the South Downs Society spotted that the footpath still legally existed. The Ramblers and the SDS, together with local people, began a long campaign to get the path re-opened. It was more or less the only bit of coastal path between Brighton and Newhaven that was not open to the public. In June 2017 their campaign was succesful. So you are walking on a bit of history. If you are a Ramblers member this is what you pay your subscription for. If you are not a member, this is why you should join. Just before a road a sign points you straight ahead. Now in front of you and too the left, to the left of the houses, you will see another signpost. Head for this. Then turn left towards the sea. At the corner of a fenced area you come to another signpost. Turn right along the cliff top. Come to another fence with a metal gate and a seat. Pass through the gate to exit the water company’s site. 8)Walk along the cliffs till you come to a small road to the sea. Descend to the White Cliffs Café and the sea. This is the end of the walk. And here we are in Spain. A group of young Spanish people have escaped youth unemployment and have taken over the beach café here, no doubt drawn to Saltdean’s Spanish character. Have a glass of wine, a cup of coffee and some tapas on the terrace. Then, if the weather if kind, descend to the costa to admire the hot men and work on your sun tan. An hour’s busking may earn you your bus fare home. You can also explore the delights of Saltdean The Saltdean web site shows that the Spanish character of the place started early. The urbanisation started in the 20s and by 1933 the Spanish Lady tea room had been opened. This was later to become Saltdean’s first pub. A feature of life in modern villas in Spain is the swimming pool. Here, instead of mean private pools, we have the art deco Saltdean Lido, one of the grandest lido’s anywhere. At various times it has been threatened with closure or has actually been left derelict, but a campaign by locals seems to now have ensured its survival. Picture Copyright the Oast House Library and reproduced under Creative Commons Licence version 2. Notice also the variety of green, Spanish-tiled Hollywood moderne houses. The design of these houses comes from Spain via Mexico, which in turn influenced the building of new homes in Hollywood and other parts of California. In the 20’s and thirties, when Saltdean was being build, people saw these houses in movies and wanted one. You can see the result. Hollywood modern houses usually have green tiles, as here, or blue ones. Typically the walls are painted white to keep out the blistering heat from the sun. On the other hand you may find that the Germans of possibly the swedes have pinched all the best bits of the beach. In this case it is possible to extend the walk by walking along the undercliff walk to Rottingdean and Brighton. © Text and pictures Copyright Chris Smith except where otherwise stated.